Kris L. Wilson found a shad spawn that led to victory in the Toyota Bassmaster Weekend Series, operated by American Bass Anglers, South East Texas Division 10 tournament, held May 11, 2013, on Lake Sam Rayburn.Running out of Umphrey Pavilion near Jasper, Texas, to fish the 114,500-acre lake, the 35-year-old angler from Montgomery, Texas, caught five bass weighing 18.35 pounds with a 5.79-pound kicker. For the Boater Division victory, Wilson took home a check for $2,648.“I found a shad spawn early,” Wilson explained. “That was pretty exciting. I caught a limit early, but no big fish. At the shad spawn, I caught fish on a Strike King 5XD crankbait in chartreuse perch and a Norman NXS in Nutter Shad. After catching about 25 fish on crankbaits, I picked up a Carolina rig with a green pumpkin senko and caught some more. I caught about 30 keepers.”In second for the boaters, Todd Driscoll, a 41-year-old state biologist from Jasper, Texas, landed a five-bass tournament limit going 17.82 pounds. He pocketed $1,324 for the effort.“I caught my three biggest fish from one spot I found in practice,” Driscoll said. “In our first spot, I fished a shad spawn on the north end of the lake and caught about 20 keepers, but not any big fish. I caught a lot of fish there on a spinnerbait.After that, we bounced around the lake fishing deep and shallow. In deep water, I caught my fish on a Reaction Innovations Big Unit Worm in hot tamale color. We probably caught about 35 fish total.”W. T. Wright, 29, of Bossier City, La., finished third among the boaters with a five-bass limit going 16.19 pounds. He anchored his bag with a 5.53-pounder to collect a check for $863.“We fished grass beds with a Carolina rig tipped with a 4-inch Gene Larew Hoodaddy,” Wright said. “We moved to the outside edge of the grass in about 13 feet of water and started throwing crankbaits. We caught fish early and had a limit by 9:30 a.m. After that, the fish got deeper in the grass. I caught about 15 fish and culled three times.”Defending BWS champion Albert Collins of Nacogdoches, Texas, placed fourth with five bass going 15.23 pounds. In fifth place, Patrick “Shane” Gammill of Huntington, Texas, brought in five keepers for 15.01 pounds with a 3.11-pound kicker. Ben Craven of Colmesneil, Texas, set the tournament big bass standard with a 6.28-pounder.In the Co-Angler Division, Sammy L. Strong, 68, of Orange, Texas, showed the younger guys how to do it. He returned to the marina with three keepers for 8.63 pounds and put $1,302 in his pocket.“We mainly fished river bends where points came down,” Strong said. “I was Carolina rigging with a 10-inch Ol’ Monster worm in plum on Seaguar line. I caught about 10 fish, but only four keepers. I culled once.”Taking second for the co-anglers, Charles Shofner Jr. of Jasper, Texas, brought in a three-bass division limit for 8.54 pounds. In third for the co-anglers, Don Jeane of Hardin, Texas, landed three keepers going 8.30 pounds with a 4.47-pound kicker. 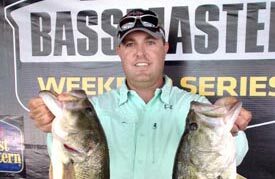 Duane W. Hill of Port Arthur, Texas, placed fourth with two bass at 7.88 pounds, but one weighed 6.26 pounds to take the division lunker title. Duane L. McDaniel of Crosby, Texas, rounded out the top five co-anglers with three bass and 7.65 pounds including a 2.91-pounder.For more information on this tournament, call Porter Trimble, tournament manager, at 318-201-3474 or ABA at 256-232-0406. Online, see www.americanbassanglers.com.